In case you didn't know, on September 1st, baseball's rosters expand from 25 to 40 players for every major league team. There are a few reasons why, none of which will be talked about. At least, not at length. For some teams, it's an opportunity to see what they have in their farm system and kick the tires, in a way. For others, it's a good opportunity to get help for the big league club to keep the veterans healthy and help out when injuries occur. For the rest, it's a time to bring up guys who wouldn't normally get a shot to play or who have been around for a while and as a reward for a decent Triple-A season, bring them up to the majors and get them a cup of coffee. That's the story of the first player on our list. Luis Jimenez is a veteran of the minor leagues in every sense of the phrase. 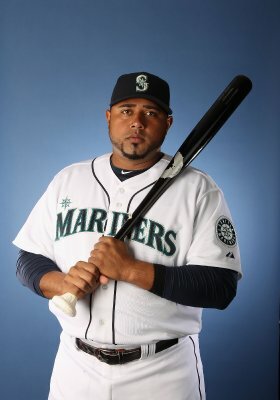 He was signed as a teenager out of Bobare, Venezuela by the Oakland Athletics in '99, started in rookie ball in 2001 and has been knocking around the minors ever since. Not literally knocking around, since every stadium would be a pile of rubble by now if he had. The Baseball Reference site has him listed at 6'3" 255lbs. That's a little, uh, generous. From what I can gather, he's closer to 300lbs. At any rate, on to the player as a player, rather than a guy who just had his dreams fulfilled. He was born May 7th, 1982, and his first appearance as a major leaguer was Tuesday night as a pinch hitter. The reason, perhaps, is his lack of position. He can play first base adequately, but unless you can mash 40 homers a season, you're not really considered a prospect. Jimenez had a career year in Triple-A, batting .310 with 20 homers and 81 RBI in 125 games. What you have to keep in mind, however, is he was playing for Tacoma who plays in the PCL (Pacific Coast League). It's a league where any Joe Blow could walk in off the street and hit .200 with 10 bombs. Not without effort of course, but you get the idea. He's played for 6 different organizations in the 10 years he's been in the minors, mainly as a fill-in, organization type guy. He has his moments with the bat, but he's brutal in the field and even with the bat, he's not somebody to get excited about. Unless you get excited about feel good stories, then hooray for you! The next and only other fresh face on the list is 22 year old middle infielder, Carlos Triunfel, coming up after hitting .260 with 10 homers and 62 RBI. The 10 homers and 62 RBI are career highs, which isn't saying much seeing as how he's only 22 and been in the minors since 2007. He showed up on Baseball America's top 100 prospects first in the pre-2008 list at #62 and again in the pre-2009 list at #89. That's not anything to sneeze at, considering there are a few thousand minor leaguers out there. After his appearance on the pre-2009 list, he hasn't shown up. In High Desert, which is more of a hitter's park and league than the PCL, he hit .287 with 8 bombs, 49 RBI and 30 steals in 2008. That was in 108 games, 436 at bats. Not exactly a small sample size. His power was expected to develop a bit more to be maybe a 10 homer guy in the majors but with 40+ steal potential and .270-.280 average to go along with it. His 2009 season was almost non-existent thanks to a broken leg that kept him to 11 games. Since that season, Triunfel has yet to get his speed back. His power hasn't quite developed yet, but he's still only 22 years old and currently in the major leagues. He's kept his strikeout rate down throughout the minors and that hasn't changed this year, only striking out 89 times in 496 at bats. He still has a little work to do in getting on base, but he may become a decent major leaguer, given enough time to develop. The other names called up should be fairly familiar to you. They are, in no particular order, Shawn Kelley, Mike Carp, Casper Wells, Alex Liddi, Carlos Peguero, Erasmo Ramirez and Hector Noesi. Kelley was sent down after Charlie Furbush was recalled from his rehab assignment since Kelley had options remaining. Carp has been rehabbing with Tacoma. Wells was sent down after Franklin Gutierrez was activated from the DL and was just waiting for rosters to expand. Liddi is a player we've seen before and we know what he is, which is why he's relegated to the bottom and no big huge paragraph or two written about him. If you don't know, he's a decent enough player, but he'll probably be a good bench player or marginal utility guy. Peguero has so much power. So much raw power. So much VERY raw power. If he ever learns that pitches that only go 58 feet are not the ones you want to swing at and maybe try to hit a ball that's actually in the strike zone, he'll be a monster. He's got a long way to go though. His plate discipline makes you wonder if maybe he's the reason for global warming, with all the friction he causes between bat and air molecules every time he swings and misses. Ramirez is a good number 4 starter, maybe develop into a 3. For a 21 year old, that's not bad. He's guy a high floor, but a very very low ceiling. So low that, there's also a good bet that we could be seeing what his ceiling as a player is right now. Noesi was.....well, if you don't remember the beginning of the season with Noesi in it, I'll spare you from knowing. And if you do remember, I'm sorry. I'm so, so, so sorry. Quick! Go outside and play! But not in the street. Hey, what are you doing sitting here reading this anyway? You should be outside! Unless it's cloudy and rainy when you are. Then no, no you shouldn't.